Derbyshire County Cricket Club has announced the first seven Members' Regional Representatives following the recent change in the Club's governance. The previous committee of 15 was replaced by a Supervisory Board of six following a Members' vote back in March when nine Regional Representative Positions were also inaugurated. Recruitment for the final two roles covering South Derbyshire and Amber Valley is on-going and the Club will appoint suitable candidates in the coming weeks. Four of the initial seven appointments (Edward Wilkinson, Malcolm Nicholas, Ian Gange and Chris Middleton) had been members of the former General Committee. They have been bestowed a Vice Presidency in recognition of their service to the Club along with former Committee colleagues JD Brown, David Skipworth, Phil Kirby and Tony Borrington who have decided not to enter the running for Regional Representative positions. Tony Borrington remains an extended member of the Cricket Derbyshire Steering Committee (partnership between Derbyshire Cricket Board and Derbyshire CCC) whilst Phil Kirby will continue to manage the operation of the popular Cricket Derbyshire Bookshop. Chief Executive Simon Storey (left) said: "Having Members' representative roles covering geographical sections of the county will encourage greater engagement and dialogue with members. It is broadly based on the best-practice model at Somerset CCC. 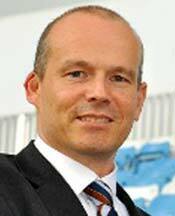 "Each of those appointed will be a representative of Derbyshire County Cricket Club (and Derbyshire Cricket Board) and will help us build closer relationships across the county with our members, spectators, local authorities, community groups and the media. "Their activities could include attending events as an official representative, presenting awards, hosting forums, assisting with introductions to potential sponsors and offering advice to the Chief Executive and Supervisory Board based on Members' feedback." Biographies and contact details for the Regional Representatives will be available on the Derbyshire County Cricket Club website, derbyshireccc.com.